hey guys this was a request from M.Culpepper and this is what I got after a week. -on track texures and trees. 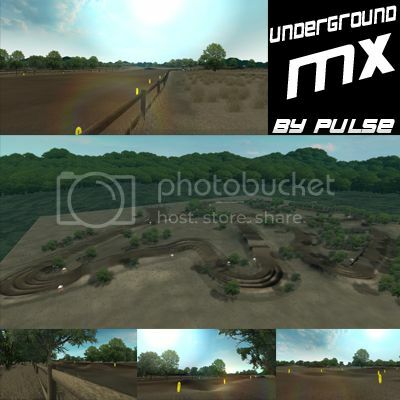 this is a replica of underground mx in texas. have fun. P.S hole track is made in earth sculptor. Such a fun track, Nice work Pulse. One thing I thought was weird was the wave ruts in the sand whoops. But really great track overall. don't like the sand. Also the jumps, ruts, bumps, etc seem overscaled. yz171kx12 wrote: don't like the sand. Also the jumps, ruts, bumps, etc seem overscaled. And again a awesome track from you pulse! Cool jumps but wierd sand section even though its fun riding in it! The sandwoops were wierd, and the track was really overscaled. I think your tracks are a bit overscaled, you should work on that aspect. well its hard to just go off a helmet cam.